Uveitis is the inflammation of the uvea, the pigmented layer that lies between the inner retina and the outer fibrous layer composed of the sclera and cornea. Uveitis can have many causes, including eye injury and inflammatory diseases. To make a definite diagnosis of infectious uveitis is a challenging task because many other infectious, and non-infectious uveitis, may have similar non-specific symptoms and overlapping clinical appearances. Co-infections in immunocompetent patients are not frequently proved with traditional serologic-diagnostic tools. 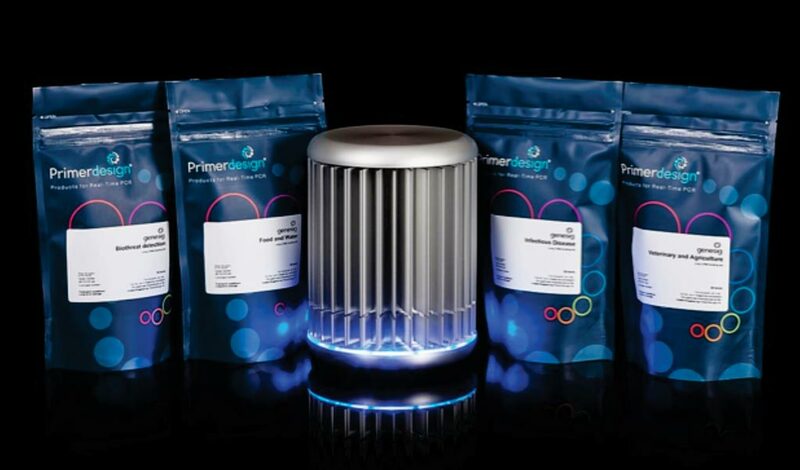 Image: Genesig Advanced kits can be used for human pathogen screening with the genesig q16, a qPCR instrument (Photo courtesy of Primerdesign). Scientists at the Del Rosario University (Bogotá, Colombia) and their colleagues carried out a descriptive transversal study, in an Ophthalmology Reference Center, from July 2014 to February 2016. Aqueous humor (AH) and/or vitreous fluid, blood and serum samples were collected from consecutive patients suspected of having infectious uveitis. All serum samples were analyzed for anti-Toxoplasma immunoglobulin G (IgG) and IgM antibody titers by using enzyme-linked immunosorbent assay (ELISA) commercial. The presence of human herpes virus 3 (VZV) IE62 gene, HVS2 UL36 region, human herpes virus 5 (CMV) glycoprotein B gene, glycoprotein B gene and the EBV (human herpes virus 4) non-glycosylated membrane protein (BNRF1) gen and Mycobacterium tuberculosis MPB64/IS6110 repeated genomic sequence, were tested with the Genesig Advanced Kit. All amplifications were performed using an Applied Biosystems Step One plus qPCR system. The investigators reported that in 66 Colombian patients with uveitis of presumed infectious origin: 22 (33.3%) were confirmed as ocular toxoplasmosis (OT), 16 (24.2%) as undetermined OT, five (7.5%) as co-infections and 23 (34.8%) as other uveitis. Toxoplasma coinfection with M. tuberculosis was identified in one case by PCR and in four cases with HSV by Goldmann–Witmer coefficient (GWC). The initial clinical diagnosis changed, after laboratory examination, in 21 cases (31.8%). Of interest, IgM serological tests for the herpesvirus family (HSV1, HSV2, HSV3 and EBV) were positive without relation to the presence of the virus as detected by qPCR in aqueous humor. The authors concluded that clinical diagnosis can be changed by laboratory examination in a significant proportion of cases of uveitis. Diagnosis of OT should combine the use of PCR and GWC to reach the maximum of confirmation of cases. The use of multiple laboratory methods is necessary to identify co-infections and viral infections that can mimic OT in immunocompetent patients. The study was published on January 25, 2019, in the journal BMC Infectious Diseases.